How does your choice take you one step closer toward turning your longing into a gift? Dear Moms and Dads and anyone else who cares to chime in, let’s talk to each other. Engage. Support. Let’s practice conception. “What a beautiful way to think of this”, was my first thought. But of course my Orphan chimed in, “after 6+ years of trying, all the doctors you’ve seen, all the effort you’ve put forth, you deserve for it to be a burden.” However, over the next couple weeks, I found my self spontaneously singing the song in the video. On last week’s call, when we were asked to invite an image of our child, I saw part of my baby’s chubby delicious arm with a little gold bracelet on it and what rose up in me was love. I tried to jump on the bench, but I wasn’t fast or loud enough. (It’s the introvert in me) I am so thank for to everyone who shared on the call. You each said something that resonated with me and I did every exercise with you. That night I had the most beautiful vivid dream that I had two daughters. It’s been years since I’ve had a dream where I had children. There was so much love in my dream and it all seemed so real. I feel I’m closer than ever to having our babies. I keep telling my husband the baby is coming. I’m looking forward to tonight’s call. Today would have been the third birthday of our baby we lost to miscarriage. Tonight we will celebrate with carrot cake (one of the few things I was able to tolerate when I was pregnant). Happy Birthday my baby, Nathan Grace. It’s been a week since our call and I am so grateful to everyone who listened to my orphans and their anger and despair. I have gotten out the sword for my nightly Body Truth practice–a real metal one, about four feet long, used by my wife in her (yes) martial arts hobby–and when I hold it piercing the space in front of myself at eye level or over my head in a “Kill BIll” style crouch, it feels marvelous. Vital and energetic and assured. I’m trying to see that Visionary in the middle frame, between the Orphan and the Ultimate Mom, a little more clearly. My dreams are full of strange new cityscapes and adventuring and flying and exploring–never a familiar landscape, always new ones. It feels like good new territory, but I think that Julia is right–there just isn’t any way I can do this alone. I very much need your help, knowing that you all are out there, connecting with the same longing, feeling how much energy and life is there inside it, so much power. My orphans whisper to me that I can do it alone, “naked in a jail cell,” don’t need help, etc etc. Thank you all for helping me learn how to ask for help. The question my orphan keeps asking is “when is it going to be my turn?” My answer on some days is “I wish I knew!” But my answer on many more recent days is, “patience my darling.” I think being invited to look at our longing as a gift IS a gift. It’s an opportunity to turn something thought of as a terrible burden around on its head. I am trying hard to remember to stop and smell the roses on my journey. It’s allowed me to feel a little lighter, like the burden is eased a little bit, keeping my eyes on the end goal but allowing myself to enjoy my life a little more along the way. I enjoyed tonight’s discussion – particularly about reading dreams. I too have a lot of dreams where I’m in the house I grew up, or am with my family. I feel comforted by these dreams, surrounded by familiar places or with the people I love. I need to look deeper for the meaning the UM is inviting me to see. I look forward to connecting with the group again in a couple of weeks. Let’s all continue to be kind to ourselves and each other! The question I am asking myself right now is how can I bring myself fully back to life, a question being asked by my V? I have felt myself shying away from life over the past few months, and feel like during this time the scope of my life has shrunk and my enthusiasm levels have generally been pretty low. Everyday has felt like a bit of a grind, to be honest. I’ve been questioning the work I do, the structure of my day to day life and have been longing for shifts, for new air, for inspiration and joy to rise again. I have realised, though, that they are not going to spring out of nowhere, that I have to help to coax them into being. And yet I’ve felt great resistance to taking visionary steps, finding it almost easier to stay stuck in my groove, even though it hasn’t been a fun place to be in! Interestingly, after a month of really bad insomnia (where I had almost no dreams), my dreams are returning and rather than matching how I’ve been feeling, they have mostly been very sweet & joyful and about fun things happening in my life. It really does feel as if the UM is whispering to me, encouraging me in this direction. I am trying to now take one small visionary step a day, something that gets me out of my routine, even if it’s as small as buying a new (& delicious) food on the farmer’s market alongside all the usual super healthy veg we always get! This weekend my husband and I are also going away for a couple of nights, to stay by the sea, unusual for us, as we spend almost all our weekends in the city . So slowly, slowly, I am determined to walk myself back to life. It was a privilege to be part of the circle last week and start the year! I will miss interacting this week – but look forward to next Tuesday. My question for today is, am I ready to receive love and give love, starting with myself, unconditionally? Am I ready to be the first person to shamelessly and utterly be in awe of myself? For how far I have come in two years of walking on this scenic route with you all right here. It is okay to love myself. This is not an egoistic love. It is a caring that my body and my entire being wants to receive and they know that the potential of this love exists in abundance. This question comes from my V. UM is right here helping her with learning to ask the question. I picked the “First Nursery” for this week. I continue to struggle with even sitting down or standing up to do body truth. I did it once last week – but it is better than not doing it at all for last I don’t know how long has passed. My V asks – what is it that is stopping me from committing to body truth? Thank you Gravid Sans Doute for your comment. I had not heard the song “Eye of the Tiger” before – it is energizing! Looking forward to coming back here to hear more and share more. Hello there, IFY, If you send me a note about it on Tuesday, I’ll guide you through a Body Truth on the call, okay? Body Truth is often the part of the practice that many of us avoid, but once you discover how much your body wants to speak and how instant the shift can be after a BT sequence, you might be more inclined to do it more consistently. Thank you for this message. I would say most of the time I am able to see the longing in my heart as a gift. 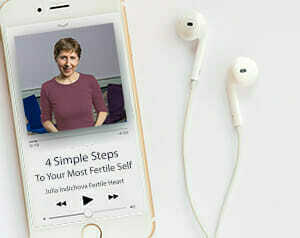 I feel I am healthier for looking closely at my life, the Fertile Heart tools have taken me through many difficult times with a healthier emotional perspective and the teleconferences have helped me with interactions with children. Very often I point out to myself that there are many in the world who would gladly exchange places with me. Would I wish to live in Syria or North Korea, for instance, even with the children/family of my dreams? One of the questions that is often in my mind is how to manage full-time work in a balanced way with my life outside of work. This has been a little challenging for me, because I expected to be much more accepted at my job, better at it than perhaps I am. It was quite difficult particularly at first. I actually got a good review from my manager, so I am grateful for that. Most days it feels better. I have been working with the Orphans Fertile Heart body truth. Sometimes I feel judged, particularly at work. So I am also doing the Visionary Body Truth where I use my “sword” and lead the battle, backed by my warring angels. I ask myself who’s judgement really matters, and it’s no one who I sometimes feel judged by in this material world that really matters (ultimately). I went ice skating with my husband last night and they played the Eye of the Tiger song, and I thought that was the perfect one to have in my mind for this body truth. I am also doing White Flower imagery.